1.1 What is a Vertical Reference Surface for Hydrography? 2.2 What is a Global Reference Frame? Land mapping and ocean charting have traditionally gathered data for quite separate and distinct purposes. Where topographic mapping ends, bathymetric charting begins. For hundreds of years now, each surveying discipline has collected data independently for different purposes. This has been hugely successful and maps and charts now cover the world. They have adequately served our needs for many years. Until now that is. In recent years there has been a growing awareness of the fragile ecosystems that exist in our coastal zones and the requirement to manage our marine spaces in a more structured and sustainable manner. There is a myriad of overlapping and conflicting interests covering this unique environment. Recent natural disasters have demonstrated an urgent need to increase our understanding of the natural processes that threaten our coastal communities. The challenge is to provide seamless spatial data across the land /sea interface. A major impediment is that we do not have a consistent height datum across the land /sea interface. Chart bathymetry (depth) is referenced to Chart Datum and land elevation (height) is referenced to a terrestrial vertical datum. These different vertical datums result in inconsistent datasets and create considerable difficulties in amalgamating and analysing data from the coastal zone. The solution lies in developing a separation model which users can use to transform between different vertical datums. Fortunately, the enabling technology; Global Navigation Satellite System (GNSS) surveying and the enabling infrastructure, a globally accessible reference frame, have both reached maturity at the same time as this realisation of the need to better manage height datum issues in the coastal zone. Over the last 4 years FIG Working Group 4.2 has worked collaboratively with practitioners and the wider scientific community to clarify the issues and offer guidance on developing a solution. A major objective has been to increase understanding of this somewhat complex subject. Presentations, papers, workshops and participation in international meetings have culminated in this FIG Guide to Developing a Vertical Reference Surface for Hydrography. This guide has been developed as a joint activity between the two relevant Commissions of FIG; Commission 4 on Hydrography and Commission 5 on Positioning and Measurement. As the current Chairs of those two Commissions, we would like to express our thanks to all members of the Working Group, for their hard work and dedication in producing this guide. We hope the guide will be a useful introduction to the topic and allow practitioners to begin to develop a uniform vertical reference surface that is consistent at the level of a port, region or nation and ultimately on a global basis. This FIG guide on the development of a vertical reference frame has been written by members of the Commission 4 (Hydrography) Working Group 4.2 – Vertical Reference Frame (A Joint Working Group with Commission 5 (Positioning and Measurement). It is not meant to be an authoritative guide on vertical datums, but is designed to be a resource for those who wish to develop a model of the separation between various vertical surfaces relevant to Hydrography. The guide contains numerous references and links that it is hoped the reader will follow to gain a greater understanding of this complex subject. Overview – gives a brief introduction and explanation of the topic including key concepts. Definitions – provides a summary of geodetic concepts for those without a strong geodetic background. Definition/creation of a transformation model – details the development of a separation model. Note, it does not go into detail, but provides sufficient information and references to stimulate the reader’s interest. Further research through the links provided will aid understanding of this subject. Surveying without directly measuring tides – a key benefit of the development of a separation model. Four case studies are included. Marek Ziebart – University College London, UK. A Vertical Reference Surface for Hydrography (VRSH) is one that does not vary significantly either over time or area. Development of a stable surface is a vital step in being able to handle modern bathymetric depth data and use it to its fullest. easier merging of different databases such as realtime tides, surge monitoring and flood prediction. The future possibilities of data which can easily be output on different vertical datums are not to be understated. Note that Chart Datum (CD) is the traditional surface to refer depths to. However Chart Datum is not a seamless reference surface as it varies from location to location. Chart Datum is established based on local water level measurements at discrete locations. There are various methods which can be employed to develop a vertical reference surface model. The chosen method will depend on existing information, available resources, hydrographic capacity and the extent of the area of coverage. A vertical datum used in hydrography is typically related to a physical surface, such as lowest astronomical tide (LAT). Such a physical surface can be determined at a specific point (e.g. at a tide gauge) but the physical surface can change significantly over a large area and over time and is therefore not optimal for managing the relationship between various vertical datum surfaces. The concept of a vertical reference surface for hydrography is one that does not vary over time or area. A stable reference surface that could be considered suitable for this is the GRS80 ellipsoid orientated and fixed at a particular epoch in terms of the International Terrestrial Reference Frame (ITRF). The International GNSS Service (IGS) has developed a global network of GNSS Reference Stations that realise and densify ITRF. For the first time in history, that allows, accurate, repeatable and cost-effective ITRF ellipsoidal heights to be propagated to tide gauges (for chart datum) and benchmarks (for the vertical datum on land). Such a set of globally consistent ellipsoidal heights allows various physical surfaces to be better managed and related. It should be noted that the mathematical ellipsoidal surface is used for relating different surfaces and not necessarily used as a working vertical datum. A vertical reference model defines the relationship between the chosen reference surface and other extant references surfaces, such as tidal surfaces and geodetic datums. Traditionally, bathymetric and topographic measurements have been collected independently to serve different purposes. Depth and height data were referred to different vertical datums, which create inconsistencies across the land-sea interface. Development of a vertical separation model will allow easier assimilation of land and maritime data resulting in seamless vertical data. Current practice is to reference depth data to a chart datum and land elevations to a terrestrial vertical datum. This makes it difficult to easily analyse processes that occur across the land/sea interface. Two critically important processes are tsunami inundation modeling and storm surge inundation from hurricanes and typhoons. A seamless vertical reference surface is also important for the growing number of coastal applications, such as coastal zone management and marine boundary delimitation. Modern hydrographic surveying, in conjunction with high accuracy GNSS, negate the need to measure tides, dynamic vessel draft (settlement and squat) and, depending on the accuracy of the GNSS system, will aid in the measurement of vessel heave – a considerable efficiency. The vertical reference surface along with suitable models relating to the working vertical datums in an area, will also allow data/products to be output on various vertical datums as requested by the customer. A consistent vertical reference surface and the relevant models are also useful for port operations by enabling accurate re-establishment of the heights of tide gauges or navigation aids established on an epoch–by-epoch basis or that may need to be replaced due to damage or destruction. Unfortunately establishing the relationships between the various vertical datums, and consequently a seamless vertical reference surface, is not an easy task. The creation of seamless data is complex and more involved than simply combining digital datasets. Ignoring technical issues such as datum types, projection, temporal changes, and error budgets will result in meaningless and unreliable geospatial information. To understand the background to a vertical surface separation model the reader needs to have a basic grasp of geodesy and geodetic concepts. A good starting place is a publication called “Geodesy for the Layman”, published by NGA, National Geospatial-Intelligence Agency. The International Hydrographic Organisation (IHO), Manual of Hydrography (M13) chapter 2 also explains these concepts well. All three-dimensional positions must, by definition, be related to a three dimensional surface. A useful figure that represents the earth is the geoid. It is defined by the equipotential reference surface. A more accessible and intuitive model, although not a strict definition, is to liken the shape of the geoid to the form of the mean sea surface in the open oceans. Unfortunately the geoid is irregular and too complicated to serve as the surface on which to solve geometrical problems such as three dimensional point positioning. 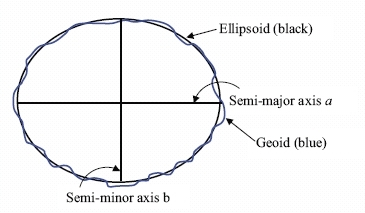 The difference between the geoid and the reference ellipsoid is called the geoidal undulation. GRS80 is the ellipsoid that best fits the geoid on a global basis and the undulations between the two surfaces range by ±110m. Prior to the advent of space based measurements, geodetic datums were locally defined and were sufficient for surveyors working in that local area. Their origins differed from the geo-centre by hundreds of metres due to regional deviations in the direction of the plumb line (vertical). These regional datums, such as ED50 (European Datum 1950) or SAD69 (South American Datum 1969), are regional ‘best fits’ to the geoids within their areas of validity. However, with the advent of satellite positioning systems a single, global geodetic datum was required. A global datum is based on the Conventional Terrestrial Reference System (CTRS). An important underlying concept is that reference systems are purely definitions and must be realised through some defined process. Three particularly relevant realisations of the CTRS are WGS84 as used for GPS, PZ90 for GLONASS and the International Terrestrial Reference Frame (ITRF). The origin and axes of these realisations are measured in metres and defined using the Cartesian coordinate system. The origin coincides with the earth’s centre of mass; the z axis is aligned parallel to the direction of the Conventional Terrestrial Pole (CTP); the x and y axes are in the plane of the equator; the x axis passes through the Greenwich meridian and the y axis completes the right handed orthogonal coordinate system (see Figure 2). 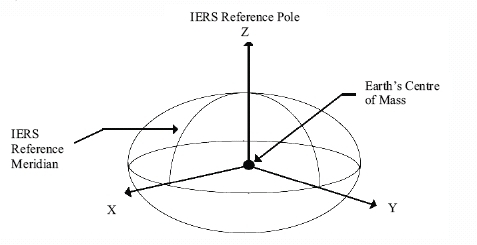 The International Terrestrial Reference System (ITRS) is a conceptual system defined by the International Earth Rotation Service (IERS). The conceptual ITRS is realised in practice by the coordinates and velocities of a set of stations on the earth’s surface. The coordinates and velocity of each station result from various global observation techniques, including VLBI, SLR, GPS and DORIS. The realisation of the ITRS by the coordinates and velocities of a particular set of stations, at a particular time and using a particular set of observations is referred to as the International Terrestrial Reference Frame (ITRF). To re-emphasise - concepts and definitions are called ‘reference systems’ and realisations are called ‘reference frames’. Various realisations of the ITRF over time include ITRF89, ITRF90, ITRF91, ITRF92, ITRF93, ITRF94, ITRF95, ITRF96, ITRF97, ITRF2000, and ITRF2005 1). The successive realisations of ITRF account for better quantities and qualities of observations, improvements to processing algorithms and better models of the movements (or velocities) of the tectonic plates. There are also many regional densifications of the ITRF such as ETRF89 (European Terrestrial Reference Frame 1989), JGD2000 (Japanese Geodetic Datum 2000), AFREF (African Geodetic Reference Frame), GDA94 (Geodetic Datum of Australia 1994), etc. GDA94, for example, is based on ITRF92 but realised at an epoch (in terms of plate tectonics) of 1 January 1994 (an epoch of 1994.0). 1) The number indicates the year of data used in the realisation. The World Geodetic System 1984 (WGS84), is the geodetic datum used for the Global Positioning System (GPS). Given the widespread use of GPS, many users claim to be working on the WGS84 datum, for example in maritime positioning and nautical charting. However, it is important to note that WGS84 is realised and maintained by the United States Department of Defense. The realisation of WGS84 comes through the coordinates and velocities used for the US military’s GPS tracking stations but civilians cannot measure relative to the data from those stations and can typically only directly access WGS84 via GPS point positions, which may have an accuracy of several metres. Fortunately, WGS84 (G11502) ) was realised to be consistent with ITRF2000 at the few centimetre level and is maintained consistent with ITRF over time. For civilian users this means that positions relative to the current ITRF are directly compatible with WGS84. Similarly, the WGS84 ellipsoid, for all practical purposes, is identical to the ellipsoid referred to as Geodetic Reference System 1980 (GRS80). GRS80 has a semi-major axis of 6,378,137 m and a flattening of 1:298.2572221101. This system was adopted at the XVII General Assembly of the International Union of Geodesy and Geophysics. Against this background and considering the context of this guide, a GRS80 ellipsoidal height measured in the current realisation of ITRF can be considered as equal to a WGS84 ellipsoidal height. Therefore, the ellipsoidal heights used to realise a vertical reference surface for hydrography should be measured relative to ITRF and expressed on the GRS80 ellipsoid. 2) The number following the G indicates the GPS week number of the week during which the coordinates were implemented into the NGA GPS precise ephemeris estimation process (NGA, 2006). There are approximately one hundred different physical height systems worldwide all related to different tide gauges. The International Association of Geodesy (IAG) inter-commission project 1.2, Vertical Reference Frames, is developing conventions for the unification of regional vertical systems to a World Height System (WHS). This reference surface is a selected geoid for which a defined relationship to the sea surface is agreed. The reference surface for geodetic heights is the ellipsoid. Ellipsoidal height can only be used as part of a three dimensional ellipsoidal coordinate system. Simplistically speaking, one can say that global geodetic datums define a worldwide reference surface for height/depth measurement. Global vertical reference frames for different applications are being developed. The idea of a global vertical reference frame is to define W0, the equipotential reference surface, best fitting the worldwide mean sea surface. From this, global and regional reference frames are developed such as the Global Vertical Reference Frame (GVRF) and the European Vertical Reference Frame (EVRF). The purpose is to connect national height datums to ensure a single height system across regions. In the short term, this development does not seem to impinge on hydrographers who work either with tidal datums or, perhaps more so in the future, with geodetic datums. Technical Resolution A2.5 of the IHO (International Hydrographic Organisation) resolves that LAT (Lowest Astronomical Tide) shall be adopted as Chart Datum where tides have an appreciable effect on the water level. Chart datum is selected as a surface that is so low that the tide will not frequently fall below it, not so low as to be unrealistic and only gradually varying between adjacent datums. Further information can be found in the IHO Manual on Hydrography M13, Ch 5. The creation of a vertical surface separation model (from herein called a ‘separation model’) can range in difficultly from very simple to extremely complex. A low accuracy, low resolution model can be easily derived using global tidal and geoid models. This section will concentrate on the development of a separation model between Chart Datum and a global geodetic datum (for ease of reference WGS84 is used but in practice the best available realisation of ITRF should be used). Interpolation of the difference between those discrete points and extrapolation of the model for a reasonable distance offshore. However, these two steps can be fraught with complications. The flowchart at Annex A describes the steps to take but the level of difficulty will depend on what separation values are already known. Figure 3 describes the relationship between the vertical surfaces. Other separation values may be known and can be used with the above diagram. Once the differences between Chart Datum and WGS84 have been found this separation can be extended offshore. It is obvious that the separation will not be constant and will need modelling. The only exception to this is where the hydrographic survey is close in-shore and covers only a small area. In this case the separation throughout the survey area can be considered uniform (e.g. in its simplest form as an offset). The variation of tide offshore can be defined using zoning. This will extrapolate or interpolate the tide or water level variations from the closest water level station. This may not be necessary depending on the nature of tides offshore (for example, in the Baltic Sea) but in some regions it is vital. A study of a hydrodynamic model of the region will give an indication of the variation of tide/water level offshore. Co-tidal charts provide an indication of the variation of the time and range of a tide. They are constructed based on historical data, hydrodynamic models and other information sources (IHO Manual on Hydrography M13, Chapter 5). These co-tidal variations can be used in conjunction with the known shore separation values to model a separation model that extends throughout the area of interest. To obtain more accurate separation values offshore tidal datum can be obtained at discrete points. This approach should be used where the accuracy of the co-tidal model is not sufficient for the users needs. A common approach for this is to use GPS and is detailed in IHO Manual on Hydrography M13, Chapter 7. The US Naval Oceanographic Office (NAVOCEANO) use both RTG/RTK GPS equipped buoys and bottom mounted tide gauges. They recommend 15 days worth of data (obviously the more the better) that will enable derivation of the four major tidal constituents. The GPS equipped buoys have the advantage of being easily deployable and the data, which is easy to retrieve, is directly related to WGS84 Datum. However, being small, the buoys are susceptible to severe weather and tampering. Bottom-mounted tide gauges are difficult to deploy and recover. Data cannot be retrieved until the gauge is recovered. They do, however, provide very reliable data. PURPOSE - What is the separation model going to be used for? The answer to this question will vary the approach needed and the resources spent in achieving the aim. There is no point expending time and resources defining a sub-centimetre separation model when the user only needs decimetre accuracy. Resource constraints with personnel, money, equipment and time? 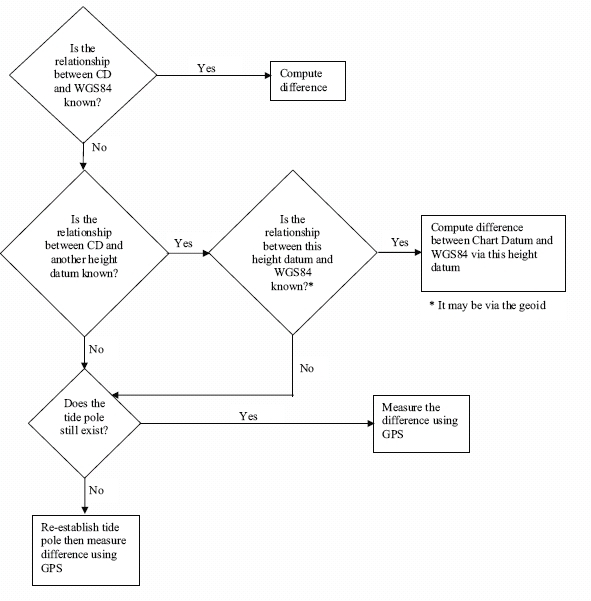 How to derive the separation between Chart Datum and WGS84/ITRF? Other models, geoid models, good co-tidal information etc may already exist in the area of interest. This may affect the approach taken in the development of the separation model. For example, it may be that a separation model exists for part of the area of interest: therefore either the model can be developed for a smaller area or the overlapping model can be used as a quality check on the model developed for the whole area. It is crucial that the end use of the model is kept in mind at all times. A separation model is of no use unless the user can use it in their systems. The model may need to be used in a variety of applications in which case it should be developed in a generic format. The cost of maintaining and updating the model should be carefully considered. A pragmatic approach should be taken for updating. The updating regime should reflect the amount of expected change in the model over time and the accuracy needed by the user. Even annual updates may be unnecessary and a waste of valued resources. The accuracy of the model will depend on many factors and the total error budget should be kept in mind at all times. All data contains errors and hence all models have an error associated with them. The key factor is knowing the errors. The greatest danger is to use data without knowing how accurate it is. Poor data is not useless data, but it should be treated according to its accuracy. For example, the UK co-tidal model has a quoted accuracy of ±0.5m in the vertical for ranges and therefore any separation model developed using these can be no more accurate than this. Tidal models use depth data to develop and refine their models. Charted depths vary in accuracy and therefore their use should bear in mind their accuracy. The GPS measurements relative to a reference station will typically contribute significantly less error than the errors in the tide modelling. Even so, care should still be taken with the GPS measurements especially to avoid systematic errors (multipath, local reference frame issues etc) and blunders (e.g. antenna height errors). Hydrographic surveying without directly measuring tides is one of the many uses a separation model can be used for. 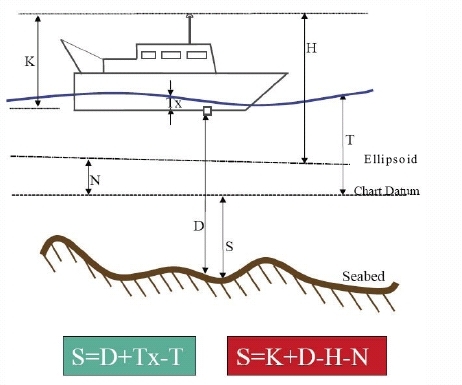 Using GNSS, such as the real time kinematic technique (RTK), sounding depth can be obtained by subtracting the height of the vessel’s antenna above the WGS84 ellipsoid and the ellipsoid/chart datum separation value, N, from the height of the antenna above the seabed (right hand equation in figure 4). Tide and, theoretically, heave/squat do not need to be measured 3). Charted depth becomes a derived product. Therefore, assuming that the surveyor can obtain their depth with respect to WGS84 accurately enough, including squat, use of the separation model negates the need to measure tides. The accuracy of the separation model. It is clear that surveying without measuring tides is impossible without a separation model. Recently NAVOCEANO trialled the ability to map the seabed on a seamless geocentric reference frame anywhere in the world to IHO Order 1 standards. Higher accuracies can be obtained using RTK. There is much research and development in this area and readers are encouraged to seek relevant conference proceedings to keep abreast with this novel application. As the ability of the hydrographic surveyor to measure their vessel with respect to WGS84 increases, this method of surveying without tides will become more widespread. 3) Note that the height of the antenna above the transducer, K, and the depth of water below the transducer, D, must both be corrected to vertical distances on the boat common reference system, installation offsets and lever arm corrections. Various nations have developed or are in the process of developing separation models. Four examples are provided below. In Australia, the AUSHYDROID has been developed for Queensland waters (Martin and Broadbent, 2004). AUSHYDROID is a model of the height of chart datum relative to the WGS84 ellipsoid (via GPS measurements relative to ITRF). The separation model has been developed using the known height of the AUSHYDROID at tidal stations and the interpolation of tide offshore has been done using the zoning process. Canada has been a lead nation in the development of separation models. In the absence of a geoid that could be used to define the separation model at the shore tide stations, Canada revisited many tide stations with GPS to calculate the separation value. Then, using hydrodynamic modelling and satellite altimetry data, the tide/water level variation off shore was developed (O’Reilly et al, 1996). The UK is developing a separation model for UK Waters called VORF, Vertical Offshore Reference Frame. Its development is nearing completion and further information will be available in due course from the United Kingdom Hydrographic Office www.ukho.gov.uk. VORF has been developed using known shore station separation values (determined via the UK geoid model) and then realising the separation offshore using a combination of hydrodynamic models and satellite altimetry data (Adams, 2003). All surfaces are modelled with respect to the GRS80 ellipsoid in order to enhance the use of VORF in conjunction with precision GNSS heighting. The following figure shows the provisional results of the difference between Mean Sea Level and ETRS89. Provisional differences between MSL and ETRS89 in UK waters (M Ziebart, personal correspondence, 2006). For many years the United States has been developing its VDatum capability. VDatum is the tool by which users can transform between 28 tidal, orthometric and ellipsoidal vertical datums (Myers et al, 2005) see figure below. It is obvious that the main effort is concentrated on the development of tidal datums and their relationship to a stable reference frame. To support this the United States’ National Oceanic and Atmospheric Administration (NOAA) developed a Chart Datum model in Tampa Bay and Delaware Bays using a hydrodynamic tidal model and a known relationship to NAD83 (Parker, 2002, Hess et al, 2003, Gesch, 2002). NOAA is now using this methodology to extend it further round the coast of Continental US (Parker et al, 2003). 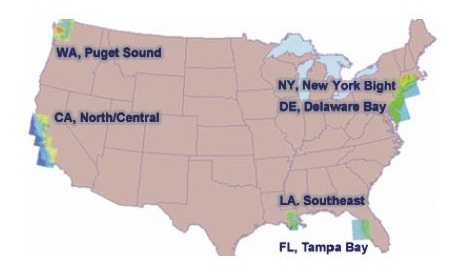 VDatum applications currently exist in Tampa Bay, Los Angeles, New York Bight, Delaware Bay, Puget Sound and California (Myers et al, 2005). It is well known that other nations have developed or are developing separation models for their area of interest. This is a key research and developmental area. “Geodesy for the Layman”, published by NGA, National Geospatial-Intelligence Agency http://earth-info.nga.mil/GandG/publications/geolay/toc.html. Further information on WGS84 can be found at the National Geospatial-Intelligence website http://earth-info.nga.mil/GandG/publications/puborder.html in particular TR8350.2 http://earth-info.nga.mil/GandG/publications/tr8350.2/tr8350_2.html (NGA, 2006). On the International Association of Geodesy website (Sub-commission 1.2, Global Reference Frames) at http://iag.dgfi.badw.de/index.php?id=36. Adams, R. (2003). “Seamless Digital Data and Vertical Datums.” Proceedings of the FIG Working Week, Paris, France, 13-17 April 2003. Adams, R. El-Rabbany, A (2004). “Development of a Seamless Vertical Reference Surface – Practicalities and Problems.” Proceedings of the FIG Working Week, Athens, Greece, 22-27 May 2004. Arroyo-Suárez, E.N., M.F. van Norden and C. Saxon (2006). “Mapping the Seabed on an Absolute Reference Frame System Using the Real-Time Gipsy (RTG) Global Differential GPS and RTK Positioning.” NAVO Navigator, Spring 2006. El-Rabbany, A. (2005). “Analysis of Hydrographic Data Uncertainty for Seamless Reference Surface.” Proceedings of the FIG Working Week, Cairo, Egypt, April 16-21 2005. Gesch, D. and R. Wilson (2002). “Development of a Seamless Multisource Topographic/Bathymetric Elevation Model of Tampa Bay.” MTS Journal, Vol. 35, No. 4. Hess, K.W., D.G. Milbert, S.K. Gill, and D.R. Roman (2003). 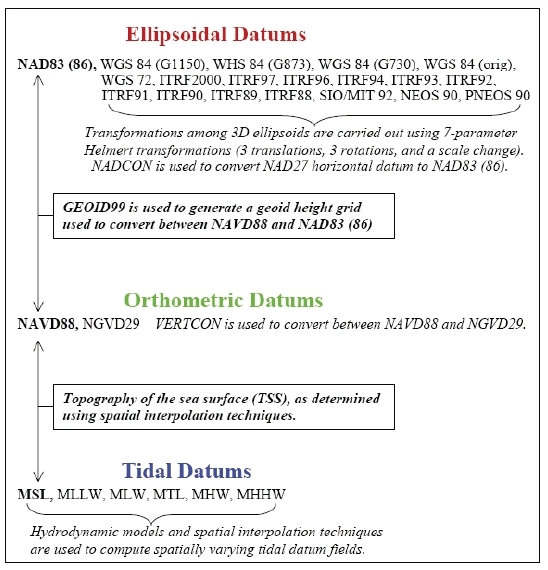 “Vertical Datum Transformations for Kinematic GPS Hydrographic Surveys.” Proceedings of the U.S. Hydro 2003 Conference, Biloxi, Mississippi, USA, 24-27 March. CD-ROM. Mann, D. and Whatrup, C. (2005). 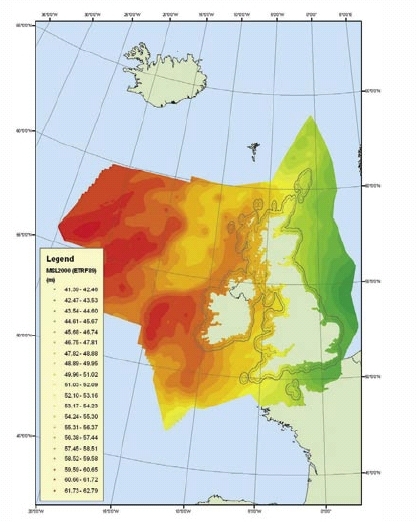 “The use of Wide Area DGPS as an aid in tidal modelling.” Proceedings of Shallow Survey 2005, Plymouth, UK, 12-15 Sept 2005. Martin, R.J. and G.J. Broadbent, (2004) “Chart Datum for Hydrography.” The Hydrographic Journal, No. 112. Myers, E., A. Wong, K. Hess, S. White, E. Spargo, J. Feyen, Z. Yang, P. Richardson, C. Auer, J. Sellars, J. Woolard, D. Roman, S. Gill, C. Zervas and K Tronvig (2005) “Development of a National Vdatum, and it’s Application to Sea Level Rise in North Carolina.” Proceedings of the US Hydro2005, March 29-31, 2005, San Diego, US. O’Reilly, C., S. Parsons and D. Langelier (1996). “A Seamless Vertical Reference Surface for Hydrographic Data Acquisition and Information Management.” Proceedings of the Canadian Hydrographic Conference ’96, Halifax, N.S., pp. 26-33. Parker, B. (2002). “The Integration of Bathymetry, Topography and Shoreline and the Vertical Datum Transformations Behind It.” International Hydrographic Review, Vol 3, No. 3. Parker, B., K. Hess, D. Milbert and S, Gill (2003). “A National Vertical Datum Transformation Tool.” Sea Technology, Vol 44, No 9, pp. 10-15. September 2003. Van Norden, M.F., E.N. Arroyo-Suárez, A.S. Najjar, (2005), “Hydrographic Surveys to IHO Standards without Shore Stations using the Real-time Gipsy (RTG) Global Positioning System (GPS).” Proceedings of the US Hydro2005, March 29-31, 2005, San Diego, US. Arroyo-Suarez, E., G. Glang, J. Riley, and D. Mabey (2005). “Evaluating a Global Differential GPS System for Hydrographic Surveying.” Proceedings of the Institute of Navigation Global Navigation Satellite System (GNSS) Conference 2005, 21-24 September 2005, Long Beach, California. Arroyo-Suarez, E., Mabey, D.L., Hsiao, V., Philip, R. (2005) “Implementation of a Positioning and Telemetry Buoy to Determine Chart Datum for Hydrographic Survey Applications.” Proceedings of the Institute of Navigation Global Navigation Satellite System (GNSS) Conference 2005, 21-24 September 2005, Long Beach, California. Barritt, C. (2001). “The State and Coastal Surveying – Surveys for safety of navigation in coastal waters.” Hydro International, Vol. 5, No. 5. Bisnath, S., D. Wells, S. Howden, D. Dodd and D. Wiesenburg, (2004), “Development of an Operational RTK GPS-Equiped Buoy for Tidal Datum Determination.” International Hydrographic Review, Vol. 5, No. 1 (New Series), April 2004. Canter, P., L. Lalumiere, (2005), “Hydrographic Surveying on the Ellipsoid with Intertially-Aided RTK.” Proceedings of the US Hydro2005, March 29-31, 2005, San Diego, US. El-Rabbany, A. (2002). Introduction to GPS: The Global Positioning System. Artech House Publishers, Boston, USA. El-Rabbany, A. (2003). “Development of a Seamless Vertical Reference System: Challenges and Opportunities.” Proceedings of the FIG Working Week, Paris, France, 13-17 April 2003. Hughes Clarke, J.E., P. Dare, J. Beaudoin, J. Barlett, (2005) “A Stable Vertical Reference for Bathymetric Surveying and Tidal Analysis in the High Arctic.” Proceedings of the US Hydro2005, March 29-31, 2005, San Diego, US. Makinen, J., (2004). 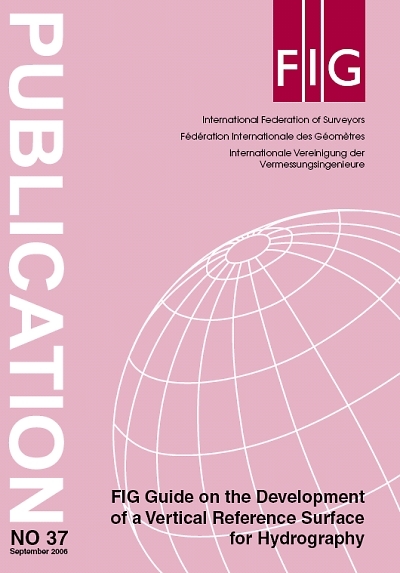 “Some Remarks and Proposal on the Re-Definition of the EVRS and EVRF.” Paper presented to the Technical Working Group of the IAG Subcommission of the European Reference Frame (EUREF), Bratislava, June 1, 2004. O'Reilly, Charles, Herman Varma and Glen King (2001). "The 3-D Coastline of the New Millennium: Managing Datums in N-Dimension Space". 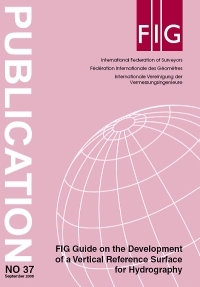 Vertical Reference Systems, International Association of Geodesy, IAG Symposia (124), February 20 - 23, 2001, Cartagena, Colombia, ISBN 3-540-43011-3, Springer-Verlag Berlin, pp. 276-281. Parsons, S. A. and C. T. O'Reilly (1998). "The Application of GPS Derived Ellipsoidal Heights to Hydrographic Data Acquisition and the Definition of Tidal Datums". Proceedings of the Canadian Hydrographic Conference '98, Victoria, British Columbia, March 1998, pp. 256 - 266. Sanchez, L., (2005). “Definition and Realisation of the SIRGAS Vertical Reference System within a Globally Unified Height System.” Proceedings of Dynamic Planet 2005, Cairns, Australia, August 22-26, 2005. Vanicek, P. and E.J. Krakiwsky (1986). Geodesy: The Concepts. 2nd Edition, North Holland, Amsterdam. Wells, D., A. Kleusberg, and P. Vanicek (1996). “A Seamless Vertical-Reference Surface for Acquisition, Management and Display of ECDIS Hydrographic Data.” Final contract report for the Canadian Hydrographic Service, Department of Geodesy and Geomatics Engineering Technical Report No. 179, University of New Brunswick, New Brunswick, Canada, 64 pp. Whitfield, M. and J. Pepper (2003). “Integrated Coastal Zone - Data Research Project.” Proceedings of the U.S. Hydro 2003 Conference, Biloxi, Mississippi, USA, 24-27 March. CD-ROM.